Home / Phono Stages / EAT E-Glo Tubed Phono Stage. The New Reference. 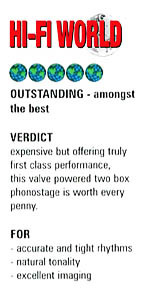 EAT E-Glo Tubed Phono Stage is the Best Sounding, Most Versatile Reference Phono at its Price. A lot more of everything we love about the S model. Bigger, better, deeper, more engaging sound – as it should be when you spend more money. The apparent difference is the dual box design and massive external power supply that accompanies the E-Glo... A wide range of cartridges was auditioned with the E-Glo, from the $379 Denon 103dl, all the way up to the $10,000 Koetsu Jade Platinum. All performed wonderfully, and because the E-Glo uses the transformers to augment gain on the MC side, MM users benefit from the high-quality present. Those using a second arm or turntable with an MM cartridge will be pleasantly surprised. The uniquely styled E-GLO looks and performs like no other. The design so clever it draws owners to display this stunning phono in their sound systems. Rather than hiding it every one will want to see it. E-Glo is an all-tube design completely free of semiconductors in its signal path. Its tube complement consists of the classic tube glass beloved by audiophiles: four ECC83s and two ECC88s. The use of these valves ensure the supplies of replacement tubes are always available. At the same time experimentation is encouraged for those who love to fine-tune the sound of their systems by changing tubes, such as EAT's premium offerings. In the fully-balanced input stage, EAT fitted a Lundahl step up transformer with an amorphous core, type LL1932. The unit's gain is 45db, plus the voltage gain of the step-up transformer. E-Glo's amplifier section uses split, fully passive equalization, without any sensationalist in global negative feedback loop, which can harm the sound. At this level of performance, only the best components will suffice. The choice of output capacitor is the highly-praised Mundorf. All other capacitors are WIMA. Mundorf Connectors with Teflon insulation have been chosen for their unparalleled integrity. To ensure the utmost flexibility and ensure perfect matching to a wide range of cartridges, the E-Glo provides capacitance loading for moving-magnet types in six user-switchable steps from 47pf to 900pF. The loading resistance for moving-coil cartridges is continuously adjustable.Ensuring quiet operation is the use of an external power supply, connected to the E-Glo via a special 9-pin connector, familiar to those who recall the legendary Cello Palette preamplifier. Its heart is a custom-made toroid transformer. The transformer features double shielding between the primary and secondary windings. This avoids the intrusion of RFI, while acting as superior mains filter. Available with Macassar or Special Order Gloss Black side panels. A lot more of everything we love about the S model. Bigger, better, deeper, more engaging sound –as it should be when you spend more money. The apparent difference is the dual box design and massive external power supply that accompanies the E-Glo. A sizeable umbilical cord connects the two, and with any two box phono stage, moving it a few feet away if possible, provides the quietest operation. Though, plugged into our recently installed PS Audio P20 Power Plant, is a thing of the past. Those not using upgraded power conditioners or cords, take note – the E-Glo is one of the quietest all tube phono stages we’ve used, even just plugged straight into the wall with supplied power cord. A wide range of cartridges was auditioned with the E-Glo, from the $379 Denon 103dl, all the wauyp to the $10,000 Koetsu Jade Platinum. All performed wonderfully, and because the E-Glo usesthe transformers to augment gain on the MC side, MM users benefit from the high-quality presenTth.ose using a second arm or turntable with an MM cartridge will be pleasantly surprised. • E-Glo 11.2 lbs. / E-Glo PS 14.3 lbs. 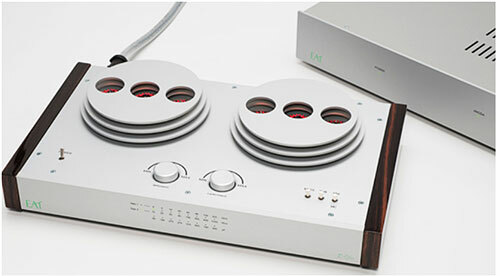 European Audio Team’s E-Glo S (named for its glowing vacuum tubes jutting out of the casework) offers up a sound that is mellow, defined, and dynamic.